Eric Lawrence from the IE team has recently covered all the ad blocking options available in Internet Explorer so far, and there are a lot :) Every solution, however, has its own pros and cons, and limitations. While Quero did a great job for IE6 till IE8, there is a demand for improvement in IE9 as posted before. Quero users have the choice to use the Quero Ad Blocker option together with the new IE9 Flash blocker introduced in Quero 5.1. 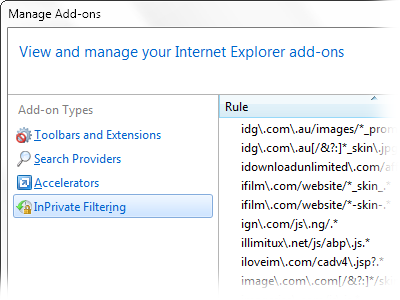 I have experimented with another option relying on the somewhat unkown but powerful IE8 feature InPrivate Filtering, which will be improved and called Tracking Protection in IE9. As of today, I am making an XML-based Ad Blocker available for Internet Explorer users, which can be used even without any add-ons. It is based on Firefox Adblock Plus extension and its most popular filter subscription EasyList. I have optimized it to work with IE and am committed to make updates to it as necessary. Adblock is based on an URL filtering list and selectively filters Flash animations and ads. You can use it in combination with Quero's Flash filter, if you like, which hides all Flash objects by default. Unfortunately, the implementation of InPrivate Filtering has some bugs as I found out today. Not all content is blocked as it should be. I am trying to contact the IE team on this issue. You can download the new AdBlock IE XML here and I wish you happy and hassle-free browsing!